If you’re planning a construction or regeneration project and need help with scaffolding in York, then we here at Burflex certainly want to hear about it. 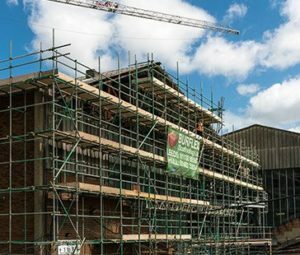 We have years of experience in providing industrial and commercial scaffolding systems to a range of sectors across York, and we’re more than confident in our abilities to provide all you need to get your project in full flow in record time. The fact that we are ISO 9001:2008 accredited demonstrates our ability to consistently provide a product that meets customer, statutory and regulatory requirements. We are also a member of the National Access and Scaffolding Confederation, proving through regular audits that we adhere to their stringent safety and technical standards. We use the very latest technology on all our jobs (including Smart Scaffolder CAD software, 3D testing and 2D working drawings), and have a team of experienced specialist designers who will talk you through all viable options and supply you with valuable insight and advice. Once everything has been agreed, we get to work, keeping you in the loop every step of the way. We’ve worked on a huge number of public sector jobs and have practical knowledge of all kinds of arrangements. Whether it’s police stations or government buildings, hospitals or secure sites, rest assured that we can work under all circumstances that are appropriate to your organisation. Safety, security, professionalism and courtesy are taken into account at all times. We provide bespoke solutions for your site and all work will comply with the rules and regulations of the National Access and Scaffolding Confederation, as well as the Health and Safety Executive. Schools are very hectic places so you need your scaffolding supplier to be completely reliable – which is why you need Burflex Scaffolding on the job. We’ve worked at schools all over the UK so you know our engineers and ground workers will be respectful of this kind of work and remain appropriate at all times. We may even inspire some of your students to pursue careers in the construction industry! From roof repairs and house extensions to renovations or solar panel installations, you need reliable scaffolding systems… which Burflex can be trusted to provide. We analyse your needs, take on board all relevant data and come up with a bespoke arrangement to suit your project perfectly. We can even show you how the scaffolding will be used on site before the project has even begun. To find out more, get in touch with us today. If you have a construction or regeneration project planned in York. Get in touch to discover how we help industrial and commercial developers in York and across the UK to make their dreams a reality.